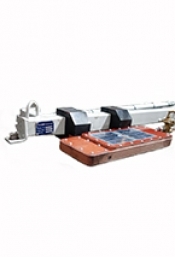 TransTech provides several types of Arm Collectors – Universal, “Junior,” and Pantograph Arm Collectors are among our standard offering to transfer current from the rail or wire. 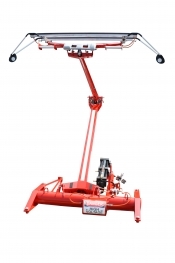 These heavy-duty collectors often consist of cast iron and aluminum arm assembly with mounting and various shapes for shoes or wheels as contact members. 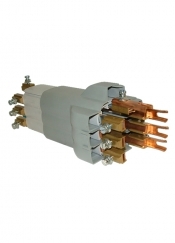 The C-Bar conductor system provides a very compact and economical means to power moving electrical equipment requiring lower current capacities. C-Bar can be installed in an over-running, under-running or side-running orientation and can be easily formed to fabricate curved conductor systems such as slip rings and three-dimensional conductor rails. Available in aluminum or copper and capable of carrying up to 550 amps, C-Bar systems require no field drilling or welding and can be assembled with common hand tools. TransTech designs and manufactures long life, low resistance carbon collector strips and assemblies for pantographs. 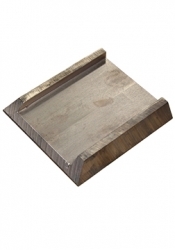 Our carbon collector strips are known to be light weight, high electrical conductivity, cause minimal arcing and have the lowest friction resistance on the market. 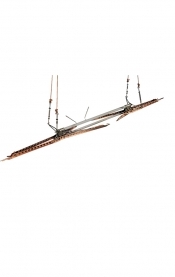 The industry's best designs optimize the wear life of our customer's overhead catenary wire while holding up to concussion that occurs during everyday use. With design, manufacturing and testing of our carbon collectors located under one United States based roof, we can continuously improve our product designs and quickly respond to our customers' needs. 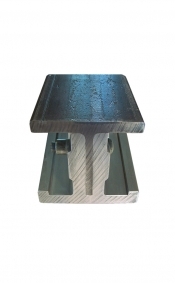 Our pantograph carbon collector strips offer integrated end horns that maintain contact in the most challenging situations. We have auto drop and impact detection systems which help maximize the wear life of our carbon collectors and pantographs. We provide replaceable contact members for all types of collectors. 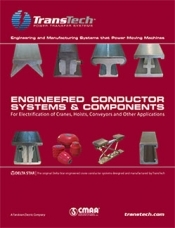 Our various shapes include contact members for wire and different conductor bar profiles. We have experience custom-designing contact members to meet your various requirements, but many of our standard offerings may also suffice for your needs. 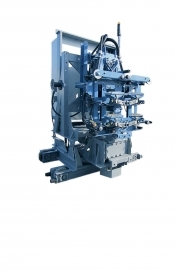 TransTech is proud to offer Stemmann-Technik Electrification Solutions for RTGs. We make it easy to take advantage of the technology by providing complete “new-build” systems and modifications for systems already in place. Electrifying your Rubber Tire Gantry Crane can save in fuel costs, maintenance costs, and the resulting standstill periods. 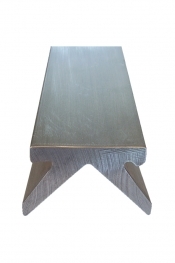 HC-Bar combines the high conductivity of aluminum with the wear resistance of a high-carbon steel into a single conductor bar comparable to the aluminum H-Bar product line. The highly conductive extruded aluminum conductor section is fastened to the steel section with compression bolts to ensure excellent electrical conductivity between the aluminum and steel. 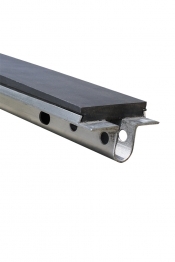 Used in applications where a steel contact surface is preferred to aluminum or copper, HC-Bar is a durable and low-maintenance conductor rail suitable for both indoor and outdoor installations. HJ-Bar combines the high conductivity of aluminum with the corrosion resistance and durability of a stainless steel cap into a single conductor bar. 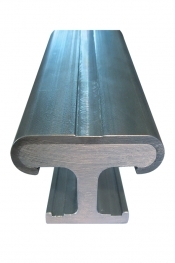 Unlike other aluminum/steel designs that use aluminum conductors bolted to standard steel rail to improve electrical performance, HJ-Bar optimizes the aluminum/steel electrical interface through a proprietary manufacturing process that provides continuous contact pressure along the entire length of the rail. 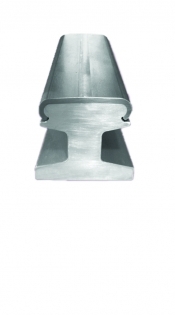 This design results in a lightweight, durable and low-maintenance conductor rail. TransTech's HV-Bar conductor system combines the economy of the lower amp H-Bar systems with the collector tracking and weather protection benefits of the V-Bar system. 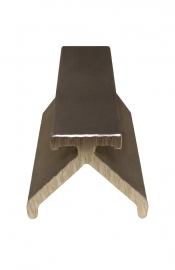 The HV-Bar conductor is rigid aluminum extruded from 6101-T6 alloy. 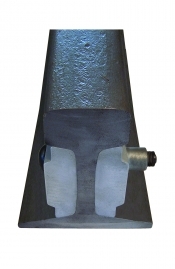 The HV-Bar system offers simplicity in installation and requires no field welding, drilling or cutting. Assembly is accomplished by means of standard wrenches as hex head bolts are used on all assemblies. Conductors are furnished in factory pre-cut lengths to fit your requirements. Installation and layout draw­ings showing the location of all components are engineered for your particular requirements and are furnished with each system. 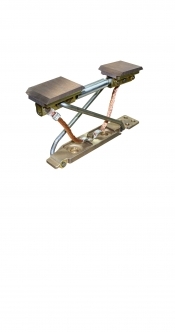 TransTech manufactures and provides an array of high-quality, low-voltage insulators, which boast a wide range of application possibilities for a variety of electrical transfer systems. We can produce Molded Polyester Fiberglass, Red Poly, Giant Strain, Corrugated and Porcelain, Porcelain Giant Strain, Molded Spool & Bracket, and Insulator Assemblies. 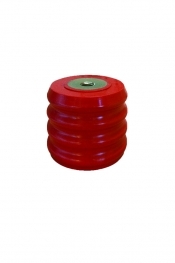 We can also provide Customizations for our insulators. 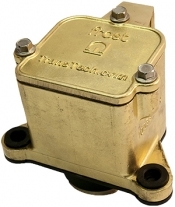 TransTech utlizes Arthur Flury Components to ensures that systems maximize their performance. Our engineered solutions offer high performance products and we work with our customers to manage the entire life cycle of your system from installation to routine maintenance. TransTech offers heavy-duty shoe-type collectors. 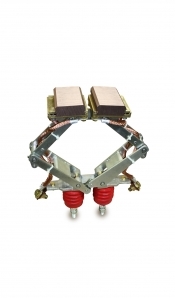 These collectors are meant for use with systems with rigid conductors as used on crane runways or other similar installations. The collector has a vertical mounting frame, spring loaded arm with adjustable springs to ensure proper contact. 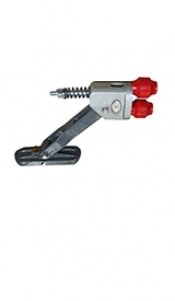 These can be assembled for either over-running or under-running applications. Contact members are replaceable and reversible for increased life and are designed to compensate for slight misalignment with the conductor. 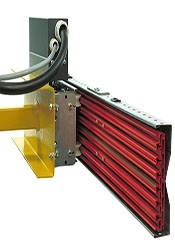 TransTech utilizes the sliprings of its sister company – Stemmann-Technik – when a rotating, sliding contact is needed to deliver electric power to moving machines. 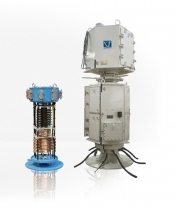 Slipring assemblies are used to provide uninterruptible energy and data transmission in all machines and equipment whose rotary motion does not permit fixed feed lines. 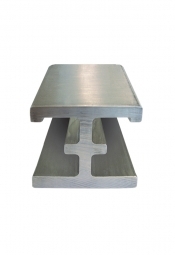 Transductor combines the electrical performance of aluminum with the strength and durability of standard steel rail into a heavy-duty, high current capacity conductor rail. 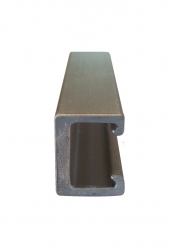 The highly conductive and corrosion resistant extruded aluminum conductor rails are fastened to the steel rail with steel compression bolts at close intervals to ensure excellent electrical conductivity between the aluminum and steel. Ideal for harsh and high-temperature environments and applications requiring very high currents, Transductor is available in rail sizes from 25lb to 115lb rail with capacities from 1800 amps to 12000 amps. Inverted 'V' conductor systems provide an efficient and economical means to power all types of moving electrical equipment. V-Bar is particularly well-suited for high contamination and outdoor applications due to its under-running design where dust and ice are unable to collect on the contact surfaces. 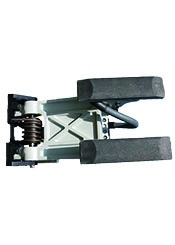 The tracking action of the 'V' rail and the current collector accommodates misalignment for long conductor runs and simplifies conductor system installation. 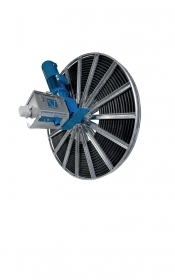 Available in configurations up to 6000 amps using a highly conductive and corrosion-resistant aluminum alloy, V-Bar systems require no field drilling or welding and can be assembled with common hand tools. 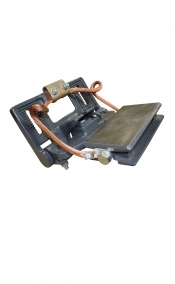 See the entire line of industrial products by clicking on the Literature link. The OMS (Overhead Monitoring System) monitors large disturbances between the pantograph and OCS interface during routine passenger service and provide alerts to allow your team to investigate occurrences, providing a proactive maintenance plan and optimizing your OCS uptime.